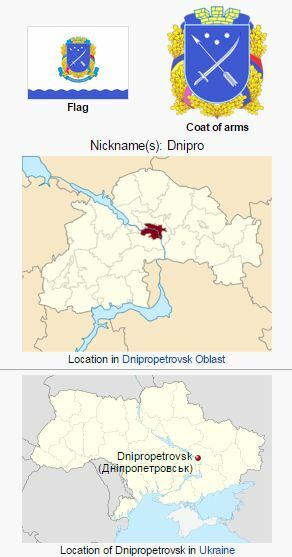 Dnipropetrovsk (Ukrainian: Дніпропетро́вськ) or Dnepropetrovsk (Russian: Днепропетро́вск), originally Ekaterinoslav (Russian: Екатериносла́в, Ukrainian: Катериносла́в), (pop. 500,000 in 1953, pop. 979,046 in 2015; coordinates: 48° 27′ 0″ N, 34° 59′ 0″ E, or 48.45, 34.983333), the capital of the province of the same name (now known as Dnipropetrovsk Oblast) in South Russia (now Ukraine), on the right bank of the Dnieper, founded in 1787. It was the largest city in the vicinity of the Chortitza Mennonite settlement, about 50 miles south, which was founded in 1789, and served as the business center for the Mennonites. In 1805 the Mennonite Heinrich Thiessen family was operating a vinegar distillery and later a steam mill in Ekaterinoslav. At about the same time, or perhaps a little later, came Heinrich Cornies and David Schroder, and then Heinrich Töws and Jakob Epp. The initial period of the Mennonite congregation ended with the coming of young Abraham Hamm and Heinrich Heese II, a son of the teacher Heinrich Heese, who was sent here as a student, and married into the H. Thiessen family. In 1889 there were in the city nine Mennonite families with about 50 souls. Ten years later there were 31 families with 158 souls. The rapidly growing milling industry, in which nearly all were engaged, kept drawing others from the settlements. At that time the following firms were in the business: J. H. Thiessen, Johann Töws, the Heese Brothers, and the Fast Brothers. The Mennonite group in the city was again augmented in 1919-1921, when many large estate owners sought protection from anarchist attacks there. At first the Mennonite services were held in a private home on alternate Sundays. For official services, such as baptism, communion, etc., they called on the elder of Kronsgarten, a Mennonite village about 40 miles (65 km) distant. In October 1889 they called their first minister, D. H. Epp of Rosental, who also served as a teacher in their school until 1912. He was followed by Johann Klassen, who had until then been the teacher of religion at the Chortitza Zentralschule, and in 1918 for a short period by Jakob Rempel, who was later ordained as an elder, until anarchy completely destroyed the once thriving Mennonite community. In 1851 the Mennonites opened a German elementary school, especially for their own children, which developed into a larger school with three teachers, and was also attended by Russian students and foreigners as a school preparatory to the Russian secondary school. In 1910 the congregation built a new school with an apartment for a teacher or minister; in it church services were also held. The war breaking out in 1914 prevented the church they had planned from being built. In its prime the Ekaterinoslav Mennonite Church had a beneficial influence on outside circles. To meet the needs of the large number of Mennonite students who came to the city to study in the Russian secondary schools there, it organized various activities with this definite objective. By means of family connections, choral groups, lectures, amateur presentations, and a large library of German books they sought to keep the young people together, away from the disintegrating influence of the metropolis. In addition to Sunday services, religious instruction was given all age groups. The first work preliminary to the establishment of Bethania, the hospital for the mentally ill, was done here, as also for the founding of the Chortitza girls' school. There were always experienced men here, who were willing and able to aid the brethren in the colony in matters relating to government institutions, banking, or church business. There was, for instance, Johann Thiessen, with all his wealth a humble Christian, always ready to help wherever the need arose, an anonymous benefactor of the poor; Heinrich Heese in his position on the board of directors of the city branch of the federal bank and many private banks; Jakob Heese, a young attorney, who devoted himself to youth work, serving many years as an excellent choral director; Heinrich Töws, in whose large, beautiful home all youth festivities were held; Jakob Esau, long a practicing physician in the Chortitza villages, then head and owner of an eye clinic in the city. Finally engineer Johann Esau must be named, who remained faithfully at his responsible post, first as assistant to the mayor, then as mayor, when none of the Russians would allow themselves to be elected because of political disturbances. Under his leadership and his energetic support, a series of welfare institutions was inaugurated in the city: a great new water system was laid, a streetcar line built, and several excellent girls' schools erected. When ingratitude and envy made it impossible for him to serve any longer, even his enemies had to recognize his incorruptible fidelity. After the Russian Revolution in 1917 the Mennonite community of Ekaterinoslav never regained the significance and strength of the former years. The large enterprises were confiscated and the Mennonites scattered. Although Mennonite students attended schools and others lived here, the community life and congregation gradually disintegrated. Hege, Christian and Christian Neff. Mennonitisches Lexikon, 4 vols. Frankfurt & Weierhof: Hege; Karlsruhe: Schneider, 1913-1967: v. II, 402. Epp, Dietrich H. "Dnipropetrovsk (Dnipropetrovsk Oblast, Ukraine)." Global Anabaptist Mennonite Encyclopedia Online. 1956. Web. 20 Apr 2019. http://gameo.org/index.php?title=Dnipropetrovsk_(Dnipropetrovsk_Oblast,_Ukraine)&oldid=144072. Epp, Dietrich H. (1956). Dnipropetrovsk (Dnipropetrovsk Oblast, Ukraine). Global Anabaptist Mennonite Encyclopedia Online. Retrieved 20 April 2019, from http://gameo.org/index.php?title=Dnipropetrovsk_(Dnipropetrovsk_Oblast,_Ukraine)&oldid=144072. Adapted by permission of Herald Press, Harrisonburg, Virginia, from Mennonite Encyclopedia, Vol. 2, pp. 174-175. All rights reserved.